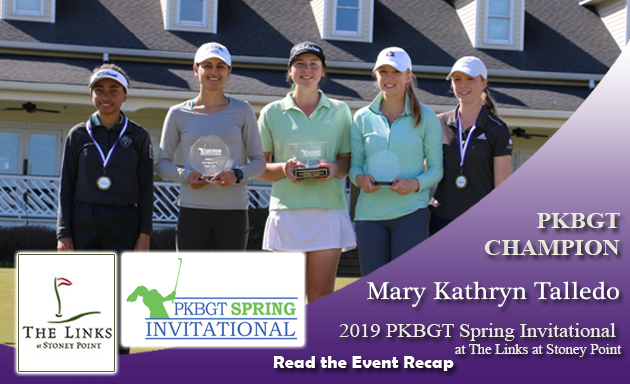 On Sunday, March 17, the Peggy Kirk Bell Girls’ Golf Tour played the final round of the 2019 PKBGT Spring Invitational at The Links at Stoney Point in Greenwood, SC. The rustic aroma of a bonfire off in the distance greeted players taking to the practice range Sunday morning. A nipping chill, more poignant than the beginning of the first round, cut through the air. An hour earlier to the day prior, tee times for the final round of the 2019 PKBGT Spring Invitational were set to commence at 10 a.m. and players arrived at the practice facilities before the sun rose over the barren trees of Greenwood, SC. The slow burn of wood diminished to ashes and smoke as the bonfire transferred its once intense heat to the players on the grounds of The Links at Stoney Point. With the 10 a.m. beckoning to the first tee the clouds dissipated, making way for the pleasant glow of that Carolina sun. Following the first round of play at the home course of the Lander Women’s Golf team, the inaugural Spring Invitational was open for the taking at all three divisions. Mary Kathryn Talledo held a one-stroke lead in the Bell National field, while there was a three-way tie in the Prep Preview field and Ellen Yu sat atop the Futures National leaderboard. The girls took to the course, beaming rays of sunshine livening the aesthetic course and setting the perfect scene for the final round of the 2019 Spring Invitational. Yes, indeed, Day Two at the iconic Links at Stoney Point came with the quintessential conditions to catch Spring Fever. At the end of the day, three players each stood alone atop the leaderboard in their respective division champion of the inaugural PKBGT Spring Invitational. Strutting with swag for the second day in a row, MK Swag held on to her First Round lead with another strong performance in the final round to win the 2019 PKBGT Spring Invitational. Mary Kathryn Talledo (Spartanburg, SC 2021) took home the inaugural championship bowl in the 22 player Bell National field with a two-day score of 74, 76 = 150 (+6). Though MK hit some bumps along the road, she turned her swag on with two birdies including one on the 10th hole to kickstart her back nine. Just one stroke behind Talledo, finishing runner up with a two-day score of 75, 76 = 151 (+7) was Muskan Uppal (Cornelius, NC 2019). Uppal had a strong front nine, making the turn tied for the lead before Talledo pulled away on the back. Making a run on Day Two with a final round low score of 73 was Caroline Craig (Sautee Nacoochee, GA 2019). Craig was a birdie machine on the front nine, sinking three. Her two-day total of 79, 73 = 152 (+8) boosted her into the Top Three, finishing in third place. Paris Fieldings (Suffolk, VA 2023) had a strong final-round performance with a 74 on the day to secure fourth place. Her two-day total of 78, 75 = 154 (+9) was capped off with back-to-back birdies on the final two holes of the competition. Rounding out the Bell Top Five in a two-way tie for fifth place was Lauren Martin (Mooresville, NC 2020) and Catie Craig (Sautee Nacoochee, GA 2021) with final scores of 154 (+10). Craig’s two-day split was 80, 74 and her final-round performance was just one-stroke back of her sister’s low score on the day. Martin’s two-day split was 79, 75 and her final round included an even-par front nine. Rallying in the final round to take the inaugural Spring Invitational in the 10 player Prep Preview division was Macy Pate (Boone, NC 2024). Pate’s two-day score of 79, 77 = 156 (+12) included three birdies on her final round. She held on through her back nine to earn the victory at The Links at Stoney Point. Finishing runner-up, four strokes behind Pate, was Madison Lynn Dixon (Inman, SC 2023). With a two-day total of 78, 82 = 160 (+16), Madison held her composure through an up-and-down final round to remain in second place. Grace Holcomb (Wilmington, NC 2021) and Abby Franks (Roebuck, SC 2023) finished in a tie for third place with scores of 161 (+17). Holcomb fired a 78 on her final round to jump into the Top Five after an 83 in her opening round. Franks faced some adversity on her final round, finishing with an 83, but rode a first round 78 into third place. Powering back on the second day with a 79, and in a tie for fifth place with Abby Hunter (Blacksburg, VA 2021), was Reagan Clifford (Mount Pleasant, SC 2020). Both girls shot scores of 167 (+23) on the weekend. Hunter went 84, 83 on the weekend while Clifford went 88, 79, capping off the Prep Preview Top Five. Like Talledo in the Bell National division, Ellen Yu (High Point, NC 2026) never relinquished her first-day lead, taking home the inaugural PKBGT Spring Invitational in the 8 player Futures National field. Yu, the youngest player in the field, took home the title with a two-day score of 81, 80 = 161 (+17). She utilized a birdie on the 16th hole to close out her final round and secure the victory. Madison Messimer (Myrtle Beach, SC 2025) finished in second place with a two-day total score of 83, 85 = 168 (+24). Messimer hit a rough patch in the middle of her final round but regained control towards the end of her back nine to ensure her runner-up finish. In third place with a two-day total score of 87, 90 = 177 (+33) was Abigail Cheney (Guyton, GA 2021). Closing out the 2019 PKBGT Spring Invitational Top Finishers were Bethany Welch (Matthews, NC 2023) in fourth place and Sophia Laliberte (Denver, NC 2021) in fifth place. Welch finished with a two-day total of 89, 91 = 180 (+36) and Laliberte finished with a two-day total score of 91, 92 = 183 (+39). We would like to extend our greatest thanks to Patrick and the entire staff at The Links at Stoney Point for their incredible hospitality throughout the weekend, hosting the Tour’s inaugural Invitational event for all three divisions. Competing on a course that has hosted events on the LPGA’s Symetra Tour, the weekend provided a challenge for all of our competitors. We would like to congratulate all of our Top Finishers at the Spring Invitational!